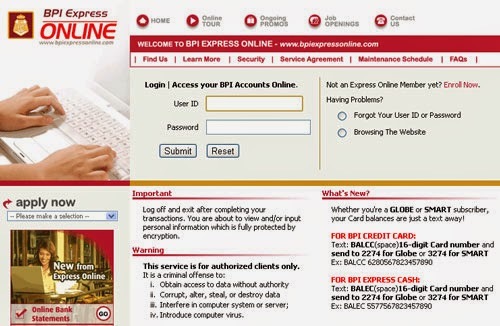 Home Tutorials BPI Express Online : You have been logoff due to inactivity! BPI Express Online : You have been logoff due to inactivity! If you're a BPI customer, you will likely get pissed off of this frequent " You have been log off due to inactivity " experience when accessing your account in BPI Express Online portal. This error happens even in the middle of a session, even though the 5 minutes limit have not lapsed yet. ( I know this is part of the bank's security protocol to avoid unauthorized access to others account they put up that 5 mins limit ). "There are ISPs who periodically change the IP address they provide to their subscribers. If the change of IP address occurs in the middle of a session, our website automatically logs off. You may also login again to Express Online and check the ISP settings with your Internet service provider." - Open your browser then, in your keyboard press CTRL + Shift + Delete . - press Clear Now and try logging in.This works most of time for me. 2. Try to use different browser to login as well.Outdated browser can be the culprit sometime. Another best way to check your BPI balance is through the mobile apps (I have tried the BPI Express Online apps with iOS and its works flawlessly with lesser ads.Way much better than checking the site in payroll day. *Note: I am not connected to BPI just one of their customers too.Hope it helps.